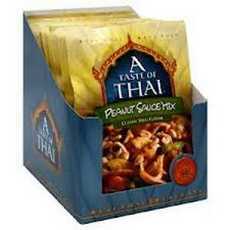 Enjoy A Taste Of Thai Peanut Sauce Mix. Peanut Sauce Mix Classic Thai Flavor. Authentic Thai Taste. Simply Combine This Mix With Coconut Milk For The Popular Thai Flavor. Use As A Marinade, Pasta Sauce, Even As A Dip For Fresh Vegetables. Don'T Forget To Try Classic Thai Peanut Satay With Grilled Chicken Or Beef. Preservative Free, Trans Fat Free, Msg Free, Gluten Free. Produced In Thailand. (Note: Description is informational only. Please refer to ingredients label on product prior to use and address any health questions to your Health Professional prior to use.